The three siblings come from humble beginnings. For more than three years of their childhood, they lived in a farm home with no electricity or running water with their parents, J.W. and Wilma, in Extra, Arkansas, in the same house where their father was born and raised. 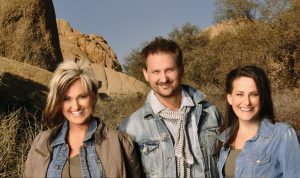 Today, they have received eight Dove Awards from the Gospel Music Association and earned a Grammy nomination. Their home may not have had power, but their spirits did, and their house was full of music. Their mother sang and taught them church songs and family harmony. They often performed at the little country church they attended while Mom played the piano. By age 12, Joyce was writing songs and also playing the piano. I caught up with her earlier this week as the group was on the way to tape an episode of Larry’s Country Diner which airs on RFD TV. The three are parents of a dozen kids, ranging in age from 9 to their early 20’s, and they all live in different states. Joyce lives in Nashville with her husband Paul, and she has two children. Jonathan lives in West Des Moines, Iowa, with his wife and their six children, including twin boys. And Judy lives in Columbus, Georgia, with her husband Jake Hess Jr. (son of gospel legend Jake Hess) and their four children. “We have lots of frequent flier miles,” she added. Every year, they look forward to returning home to the family farm in Arkansas (now complete with utilities) at Thanksgiving for “Martin time.” “We take as many kids as we can take and spend four to six days together—it’s one of our favorite things to do,” she said. Performing through the year with the kids back home is a juggling act, she acknowledges, but their goal is to “be sure to make them feel like they’re more important than anything else we do,” she said. “We have to take that time off to invest in them, and the older they are, the more we need to make that a priority.” They have two preparing for their high school graduation this spring. Our interview took place on Tuesday, April 10, the day before the siblings were scheduled to do a tandem jump out of an airplane at the invitation of the Army Golden Knights who ask different celebrities to participate every year. Fortunately, they survived the jump, which will serve as a promo for their new project, Still Standing, set to release on July 13 under the Gaither Music Group label. Watch all the fun HERE. But there was a time when they weren’t doing everything together. They took seven years off the road from 2003-2010 and went their own separate ways. Jonathan and Judy did some solo appearances, and Joyce tried, but she said “it just wasn’t something I wanted to do. I found something else to do during that time, I didn’t want to sing.” She didn’t want to be a part of church or gospel music due to her emotional and spiritual state at the time. While the group was disbanded, she also said her family was “unhitched.” Then she got a phone call. Comedian and singer/songwriter Mark Lowry was doing a concert in Nashville, and he wanted the group to sing just one song—just for him. She did not want to do it but gave in to the pleas of her brother and sister who promised she wouldn’t have to say anything—she would just sing one song.